The NF-κBs are a family of ubiquitously expressed transcription factors that have been described to be responsible for the establishment of an inflammatory response. Studies in the past decade have also demonstrated this family's role in the initiation and progression of hematological and solid tumors. Recently, research has uncovered a specific role for NF-κBs in the development and maintenance of ovarian cancer. Epithelial ovarian cancer (EOC) accounts for the majority of ovarian cancer and is the most lethal of all gynecological malignancies. It was expected that 21,550 new cases of EOC would be diagnosed in the US in 2009 and that 14,600 women would die from the disease . Although ovarian cancer accounts for only 3% of all female cancers, it is the fifth most common cause of cancer deaths in women. Given that EOC usually presents with non-specific symptoms, such as bloating or abdominal discomfort, which can all be mistaken for a more benign condition, and because there is currently no means for early detection, patients with EOC are often diagnosed with late-stage disease (International Federation of Gynecology and Obstetrics (FIGO) stage III or IV). On initial diagnosis, patients undergo complete surgical debulking (resection whose only goal is to make subsequent therapy more effective) followed by combination chemotherapy usually consisting of carboplatin and paclitaxel. Approximately 80% of patients respond to this treatment regimen, which has been the standard for more than 10 years . However, 60 to 80% of the responders present with recurrent disease between 6 months and 2 years after treatment. Unfortunately, disease recurrence is characterized by chemoresistance, resulting in disease progression and death. As a result, the 5-year survival rate for patients diagnosed with late-stage disease is only 15 to 20% . Chronic inflammation has been associated with tumor initiation and progression. In the ovary, carcinogenesis has been linked to inflammatory processes, such as repeated ovulation, endometriosis and pelvic infections [4, 5]. The molecular link between inflammation and cancer is nuclear factor κ light chain enhancer of activated B cells (NF-κB) . The NF-κB family of proteins, which has five members (Table 1), controls several key processes that are required for tumor development and progression, such as: activation of anti-apoptotic genes and genes involved in the progression of cell cycle [7, 8]; secretion of factors such as tumor necrosis factor (TNF) α and interleukin (IL)-6, which enhances cell growth ; promotion of a pro-angiogenic environment through enhanced production of IL-8 and vascular endothelial growth factor ; and creation of a microenvironment that may prevent immune surveillance  (Figure 1). The NF-κB pathway. In unstimulated cells, the NF-κB subunits p65 and p50 are sequestered in the cytoplasm by IκB. Ligand binding to receptors (such as TNFα and TLR4) leads to the activation of the IKK complex, which then phosphorylates IκB. 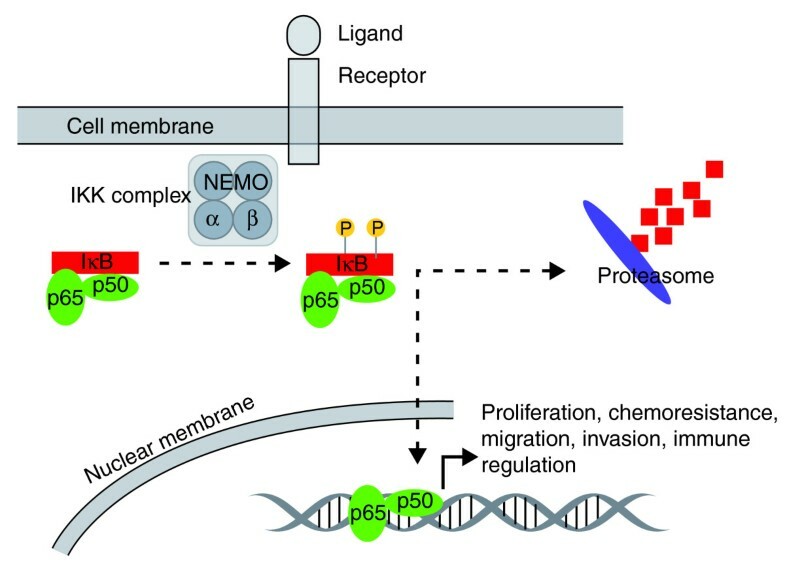 Phosphorylated IκB is then ubiquitinated and degraded by the proteasome system, leading to the release of p65 and p50. The heterodimer then translocates to the nucleus and initiates the expression of genes that regulate proliferation, cell death, invasion, migration and immune regulation. This is the canonical pathway; there is also a non-canonical pathway involving other NF-κB family members. Most of the studies on EOC have looked at the members of the canonical pathway. A correlation between NF-κB activation and EOC clinical profile has been described. Guo et al. demonstrated that the expression of NF-κB p65 in EOC tumors is mainly nuclear and that the levels correlate with poor differentiation and late FIGO stage. Moreover, they showed that patients who were positive for NF-κB p65 subunit staining had lower cumulative survival rates and lower median survival (20% and 24 months, respectively) than patients that were negative (46.2% and 39 months, respectively). The correlation between NF-κB activation status (that is, levels of NF-κB p65 and RelB) and poor clinical outcome in EOC patients was corroborated in more recent studies by two other independent groups [12, 13]. In addition to these correlation studies [11–13], the in vitro activation or specific inhibition of the NF-κB pathway using either small-molecule inhibitors or short interfering RNA (siRNA) was recently shown to affect the growth behavior of EOC cells. Using the ligand TNF-like weak inducer of apoptosis (TWEAK) to activate NF-κB in the highly metastatic human EOC cell line HO-8910PM, Dai et al. showed that although TWEAK-induced nuclear translocation of NF-κB p65 does not enhance cell growth, treatment with TWEAK for 6 hours can significantly enhance adhesion and promote the migration and invasion capacity of these cells . These effects were inhibited when cells were treated with TWEAK in the presence of the NF-κB inhibitor pyrrolidine dithiocarbamate. In another study, which showed that microRNA-9 (miR-9) could control the levels of NF-κB1, the authors  showed that a decrease in NF-κB1 levels, as a result of overexpressing miR-9 or by using the siRNA expression vector pSilencer/si-NF-κB1, is associated with a reduction in cell growth and colony formation by the human EOC line ES-2. In a more recent study using several EOC cell lines, Hernandez et al. showed that inhibition of the NF-κB pathway through specific inhibition of inhibitor of NF-κB kinase β (IKKβ) can decrease the percentage of viable CAOV3, IGROV1 and A2780 cells. In addition, they showed that blocking IKKβ activity through either small-molecule inhibition or siRNA can inhibit anchorage-independent growth and the capacity of the cells to invade through a basement membrane. More importantly, the authors  identified the network of genes controlled by the IKKβ-NF-κB pathway in CAOV3 cells. Using the highly specific IKKβ small-molecule inhibitor ML120b or IKKβ siRNA to decrease IKKβ expression, gene expression microarray results showed that the IKKβ-NF-κB pathway controls genes associated with EOC cell proliferation, adhesion, invasion, angiogenesis and the creation of a pro-inflammatory microenvironment. Our group has identified a subpopulation of EOC cells that is responsive to the pathway involving Toll-like receptor 4 (TLR4) and NF-κB . Treatment with the chemotherapy agent paclitaxel, which is a known TLR4 ligand, induced NF-κB activation, leading to enhanced cell proliferation. NF-κB is constitutively active in these cells, resulting in constitutive secretion of pro-inflammatory cytokines , and this is brought about by constitutive IKKβ activity . These cells also express the cancer stem cell marker CD44 and are in fact the ovarian cancer stem cells (OCSCs) . The CD44+ OCSCs are resistant to chemotherapeutic agents, and this resistance is partly regulated by the NF-κB pathway . In our most recent study , we showed that the NF-κB inhibitor Eriocalyxin B can sensitize these cells to TNFα- and Fas-mediated apoptosis. The CD44+ OCSCs can also serve as tumor vascular progenitors in vitro and in vivo, an effect also regulated by the NF-κB pathway . Research in the past 5 years has unraveled the multiple mechanisms that enable NF-κB to support ovarian carcinogenesis, including that this pathway confers some of the properties of OCSCs. These findings highlight the clinical potential for NF-κB inhibitors to prevent recurrence and improve survival in EOC patients. The fact that the main effectors of this pathway significantly correlate with disease activity suggests the feasibility of choosing patients that may benefit from targeting this molecular pathway.